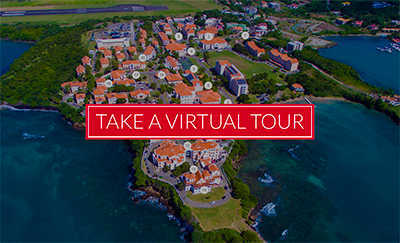 More than 40 Years of Higher Learning on the Island of Grenada. Founded as an independent School of Medicine in 1976, St. George’s University opened its doors to students beginning in January 1977. It has evolved into a top center of international education, drawing students and faculty from 140 countries to the Caribbean island of Grenada, in the West Indies. Students attending SGU enjoy the benefits of a thriving multicultural environment on the True Blue campus, offering all the amenities and technologically advanced facilities of a world-class institution. The University’s more than 20,000 graduates include physicians, veterinarians, scientists, and public health and business professionals across the world. The University offers medical and veterinary medical degrees in the Schools of Medicine and Veterinary Medicine, and independent and dual graduate degrees in the sciences, public health, and business. Undergraduate degree programs are also available through its School of Arts and Sciences, and students may build on their education by pursuing a degree in the School of Graduate Studies. The University programs are accredited and approved by many governing authorities, and SGU is affiliated with educational institutions worldwide, including in the United States, the United Kingdom, Canada, Australia, and Ireland. St. George’s University holds to these truths: Our highest purpose is education and there is no better education than one that is truly international. We are committed to developing the intellectual capacity, creativity, and professionalism of our students, immersing them in the rich diversity of human experience and aspiration. As a result, they are prepared to shape the future of our world while adding to the knowledge base of humankind.